Welcome to the Rixton and Astley Shooting Club web site (aka, Astley Gun Club). 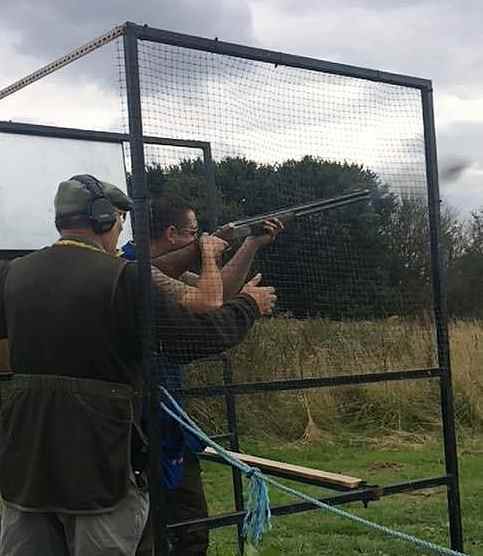 We are a small friendly Clay Pigeon club based just off the A580 East Lancashire Road in Astley and have been established now for over 30 years. A warm friendly welcome awaits shooters, be they members, guests or visitors. In June 2015 the club was taken over by two St. Helens based businessmen, John Webster and Mark Hughes. Both are keen game and clay shooters. John Webster is also a BASC Accredited Shotgun Coach; BASC Safety Officer ,BASC Safe Shot Assessor and a Registered Firearms Dealer. Assisted by his son Martin, and a group of dedicated friends who turn out in all weathers to make the club the success that it has become. * Car Park and all cabins have been moved to a new location, vastly improving the facilities. * Cafe has been replaced and refitted. Now open at 9am. for brews and bacon baps etc. * Large sheltered seating area is currently under construction. * Several additional stands have been provided with plans for more in 2017. * Interstand walkways have been provided to improve the underfoot experience. * Several hundred trees have been planted to improve the ground. * Significant improvements have been made to ground safety and signage. * Shoot has been changed from the former 30 clays over 5 stands, to 80 clays over 8 stands, with plans to move to 100 clays over 10 stands during the 2018 season. * Shooting now commences at 10am, last entries at 1pm. Please see Events Calendar for shoot dates. * BRB dongle and counter system has been installed. * All traps have been revamped and modified to a high standard, and now opperate via radio control. * All stands can be solo controlled via count down beep and release technology. * Several new Laporte traps have been purchased with more new traps to follow in 2018. * 2 practice stands have been introduced for use by coaches and members. * Targets are changed for every shoot. No two shoot days will ever be the same. * Membership is renewed in March each year, but new members may join throughout the year on a quarterly pro-rata basis. * Membership is currently open. * R & A S C is now a C. P. S. A. Affiliated Club.